Meeting celebrated auteur, Gus Van Sant, to discuss his fourteenth feature film, RESTLESS, at the Toronto International Film Festival, certainly had my nerves on edge, given that I’m a bit of an admirer of his. It didn’t help matters much when he would pause and stare at me blankly for five or ten seconds after almost every question I asked. Fortunately, I realized very quickly that I was not the problem. “You can definitely become overworked talking to the press,” Van Sant admits to me of the whirlwind that is the contemporary festival experience. “When I hit the five-hour mark, I start to get pretty spaced out.” Our interview was his last before lunch so that explained a lot. By French, he must mean tragic because what forces these two outside of their circles is death. Everyone’s favorite indie darling, Mia Wasikowska and endearing newcomer, Henry Hopper, play the two particular kids in question. Hopper is Enoch, a high school dropout who lost his parents in a car accident and now keeps the company of what is either the ghost of a Japanese kamikaze pilot (Ryo Kase) or a very creative imaginary friend. Wasikowska plays Annabel, a free-spirited naturalist, who has just learned that she is going to die of cancer in a few short months. 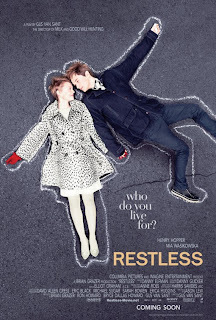 Their relationship and its youthful naiveté give Restless its unexpected whimsy. The relief Enoch and Annabel find in each other is what drew Van Sant to the Jason Lew screenplay to begin with. “It’s common with younger cancer patients that they often make new friends with strange people,” he explains of their attraction. “Their regular support group is too devastated to keep their normal relationship going, because of the sadness.” Subsequently, the charming couple provide the audience with some much needed relief from their reality as well. Hopefully, it will not be his last. This interview originally appeared in Hour Community. It feels as if Mia Wasikowska is everywhere these days. It’s she and Ryan Gosling. Not that I don’t like them, I really do. I just hope they won’t wear out too soon. I definitely want to watch this movie. It’s coming up in my country in the end of November; hopefully they’ll run it in the city where I live. I really want to see this movie. Having a difficult time finding out where I can see it. Places are so discriminant when it comes to good film! This is not my favourite Gus Van Sant film, by any means. It has some lovely moments and a pretty steady tone but it can be a bit much to buy into at times. I’m sure it will make its way to both of you before you know it.